With many seasonal products, a growing product range and several production plants, Araco was facing challenges with expansion. Microsoft Dynamics NAV was not enough and the company needed more sophisticated functionality for inventory optimization and demand forecasting. 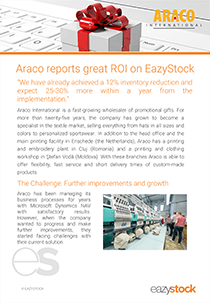 EazyStock enabled Araco to get better insights into their seasonal items and made is easy to follow trends in demand patterns on all products. Six months after implementation, they have already achieved a 12% inventory reduction and they expect that within a year of using EazyStock, they will achieve a reduction of 25-30%.